Jeremy Kirby, the Brewmaster at Sunken City Brewery, moved his family to the small town of Hardy near Smith Mountain Lake, Virginia to brew beer where no one else has brewed beer before. 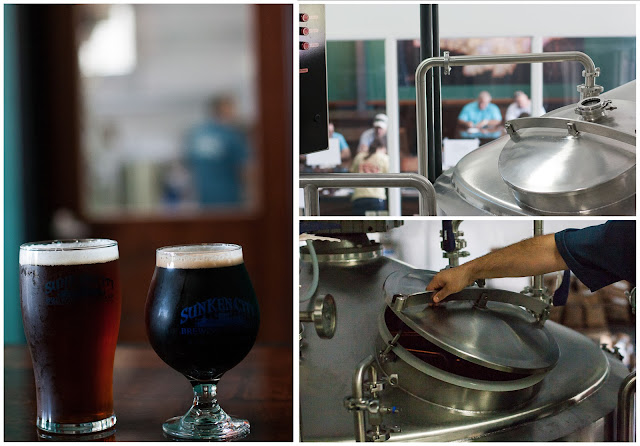 This is hard to find in today’s United States, where every thriving metropolis from Colorado to Baltimore City has new small-batch breweries popping up every day creating exceptional hand-crafted beer that make the Executives at Budweiser cry their big boy eyes out. But Jeremy was intent on finding a hidden city to allow him to craft his brew for a new market, and he found the perfect spot at Sunken City Brewery. 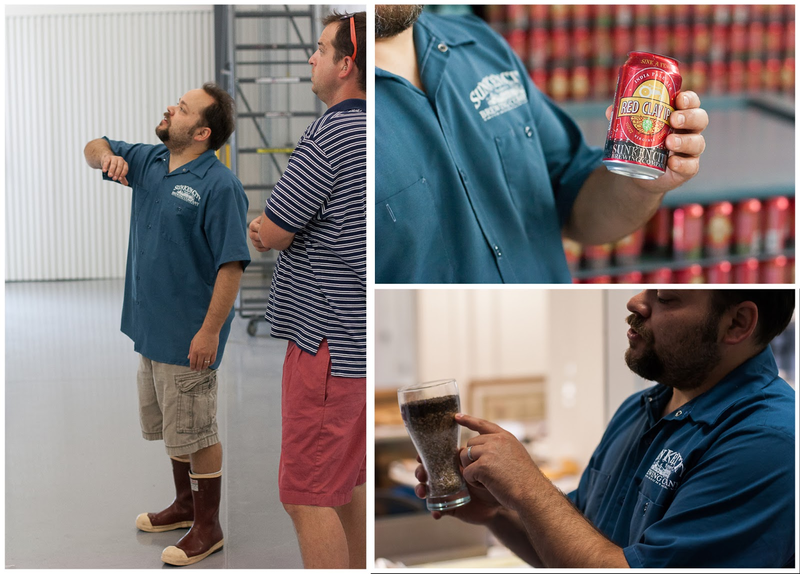 Jeremy was kind enough to give us a tour of Sunken City Brewery during out last visit providing us with a behind the scenes look at the guts of the brewery and a brief history behind the name. As legend has it, an entire town was submerged in Smith Mountain Lake when the damn was built and the lake was born, swallowing cemeteries, churches, and brothels alike. The brewery has a large map on the back wall illustrating where the sunken city is located underneath the vast lake as it stands today. Jeremy was also proud of the breweries high tech gadgets, especially the new canning machine that will help Sunken City Brewery spread their beer to even more thirsty mouths. Although the canning machine will speed up the process, it is still a slow and artistic procedure involving only a few skilled employees. 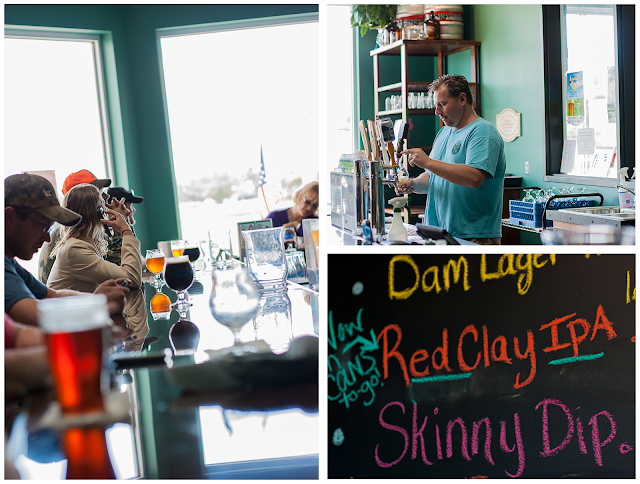 Lots of love goes in to each six pack of Dam Lager or Red Clay IPA, sold cold and fresh behind the bar. Sunken City Brewery has been opened for just over a month, but it had the interest of the townies while the brewery was still under construction. That’s what you get for opening something really cool in a town that desperately craves it. If Sunken City Brewery keeps producing unique fresh beer and giving patrons what they want, the sky is the limit. The owner, Jerome Parnell, knows this all too well. He’s a businessman at heart while he gives Jeremy free reign to help their dreams come alive. Jeremy brews, Jerome sells. It’s a match made in brewery heaven. 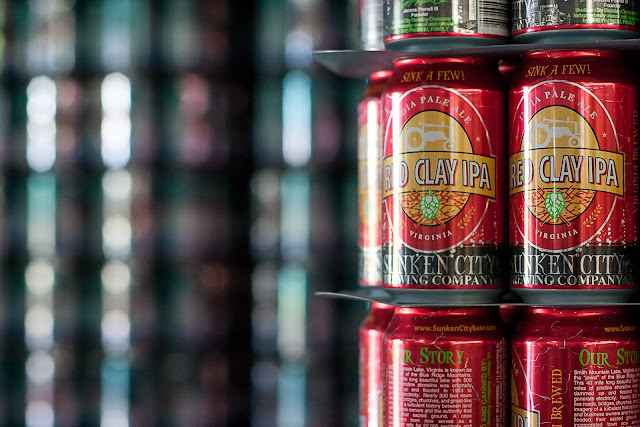 Locally brewed and hand-crafted beer is the corner stone of Sunken City Brewery, but Jerome Parnell has dreams to expand selling to local restaurants and grocery stores. There are a few things Sunken City Brewery can do to solidify their place in the community, the most important being adding a full time food or bar snack menu. Right now, Jerome is content selling potato chips as a snack to hungry customers, or throwing evening parties where local food trucks and musicians sell the food and entertainment while Sunken City Brewery sells the beer. However, Jerome’s response to my question regarding the possibility of a gourmet bar snacks menu was “You are the 9,000 person to ask me that”. Although adding a menu to the brewery is an added expense and worry, Jerome should take the hint. He’s selling great beer that makes his customers tipsy upon consumption. A gourmet bar snack menu will only help Sunken City Brewery get patrons to stay longer to drink more beer while satiating their need to nibble. 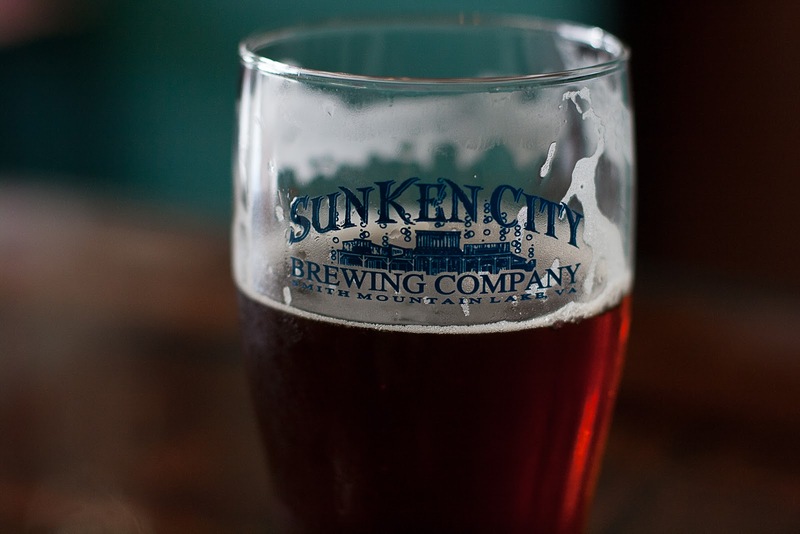 Sunken City Brewery is a much needed addition to Smith Mountain Lake, a community toppling over with crowds in the summer to enjoy the water, and residents who enjoy serenity, good food, and drink. Jerome and Jeremy have created a brewery that can beat the odds in a town that loses interest quickly when things aren’t done right. They are also taking advantage of social media, with a thriving Facebook fan page that keeps customers laughing and interested in the breweries next move. I see a bright and beer-filled future for this duo. One of the best breweries in the Central Virginia area. Great story! Thanks and stop by again!! Amazing post and fabulous trip!